Federal corporate tax revenues have been on a downward trend since 2016. That is unusual in a recovering and growing economy. The recently enacted corporate tax rate cut from 35 to 21 percent has accelerated the downward revenue trend, a result expected by everyone with a thought process more guided by empirical evidence than ideological orthodoxy. The figure below shows how much more sharply corporate tax revenue has been declining since the recent cut in the U.S. corporate tax rate. Each point on the graph’s line shows the sum of the prior 12 months of U.S. corporate tax collections. 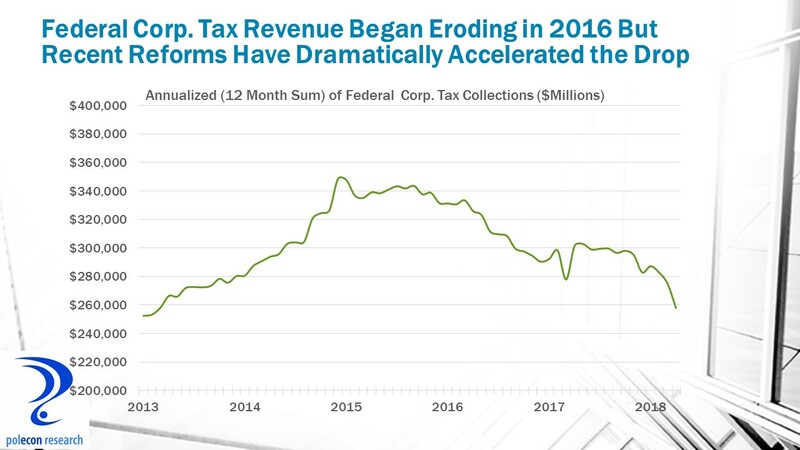 Thus, the large recent drop in the 12 month sum of corporate tax collections (as of April 2018) includes only a few months of the new lower rate, yet it still shows a precipitous decline in annualized revenue. I would like to have seen more real “reform” along with a more gradual corporate rate cut (along with some spending reforms to limit impacts on federal deficits) but the U.S. and New Hampshire business tax rates were too high and needed to be cut. Still, no one who has even a cursory knowledge of the research and evidence on corporate tax cuts expected that such a large rate cut from 35% to 21% would actually increase corporate tax collections. The best that can be said about the impacts of a large corporate tax cut is that it will lose less revenue over time. That doesn’t mean that a tax cut will always result in an absolute decline in revenues, although that has clearly been the case with the recent U.S. tax cut. Revenue can still increase with a small rate cut even though revenues may be lower than they would have been had rates not been cut . That is the case with New Hampshire’s very modest, recent cuts in business tax rates. Business tax revenues (for the most part) continued to increase in NH but at a slower rate of growth after the cuts where enacted. New Hampshire is expected to have a more than $100 million budget surplus by the end of fiscal year 2018. New Hampshire risks drawing two inaccurate conclusions from this surplus and the recent sharp increase in business tax collections that is largely responsible for it. First, that the small drop in 2017 in the state’s business profits tax (BPT) rate from 8.5% to 8.2%, and business enterprise tax (BET) from 0.75% to 0.72%, is responsible for the recent large increase in NH business tax revenues and subsequent state surplus. Second, that a larger rate cut would produce even more business tax revenue and perhaps an even larger budget surplus. Again, the rate cuts were needed but NH should understand that the rate cuts have not, and will not in the future, lead to a surge in business tax revenue. If NH’s business tax cuts had actually produced more revenue (than if rates had not been cut) the growth rate of business tax revenue would have increased following the rate cuts. In fact, the growth rate in business tax collections declined after NH’s rate cut took effect for tax periods beginning after December of 2016. That is until the federal government lowered its corporate tax rate. Again, it’s not that business tax collections actually declined, the U.S. and NH economy were strong and profits were increasing, it’s just that NH, by marginally lowering tax rates, decided to capture a little less of those profits and thus the growth rate of business tax revenue declined. 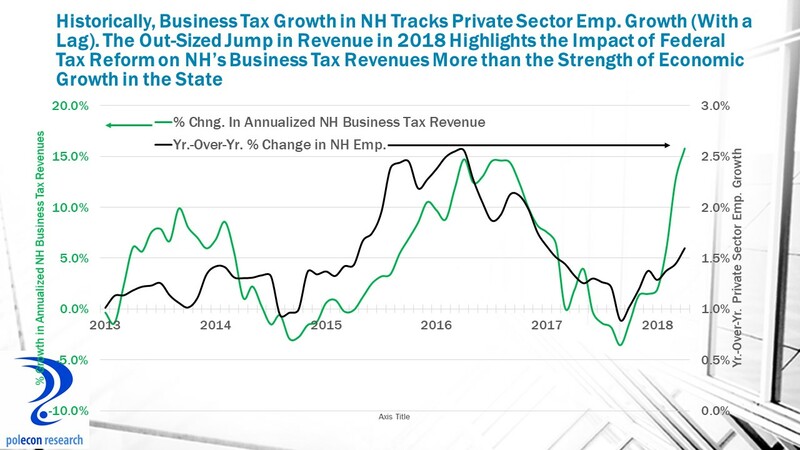 The figure above shows that the annualized growth rate in NH’s business tax revenues declined throughout much of 2017 (although the final months showed some modest reversal of the trend). Annualized revenue growth jumped dramatically, however, in the first four quarter of 2018, after the cut in the federal corporate tax rate. The chart also shows that the growth rate of NH’s seven largest sources of general revenue – other than the BPT and BET – that are dependent upon economic conditions and economic activity in the state (meals and rentals, liquor commission revenues, tobacco, real estate transfer, communications services, interest and dividends, and insurance taxes) are growing much more modestly, below the trend from recent years, and certainly not enough to produce a $100 million plus budget surplus. Clearly business tax collections are responsible for NH’s large budget surplus, but it is not accurate to say that the increase in business tax collections reflects a “booming NH economy” as many in the state argue. NH’s economy is strong but not exactly “booming” (1.3% year-over-year job growth ranking 21st nationally, and 1.9% GSP growth ranking 26th) and not nearly strong enough to produce the kind of business tax revenue growth that the state has seen in recent months. 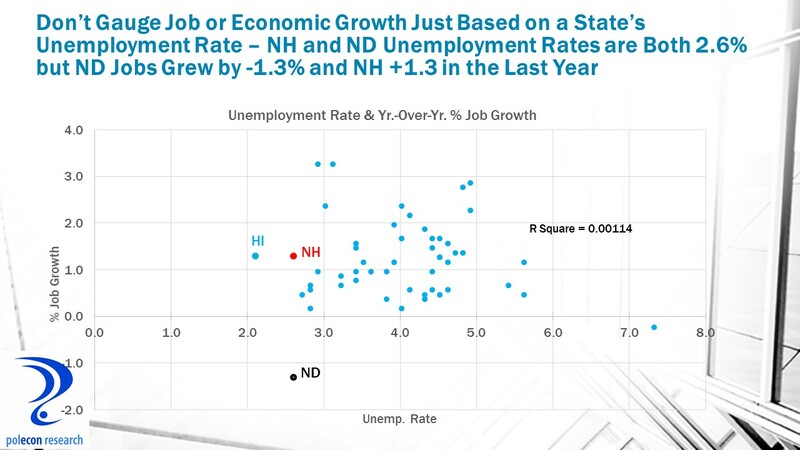 Excuse this brief sidetrack (it is a pet peeve) but don’t assess growth in NH’s (or any state’s) economy on the basis of a state’s unemployment rate. Hawaii, at 2.1%, currently has the lowest unemployment rate in the nation followed by NH and North Dakota tied at 2.6% – but here is the thing, over the past year the North Dakota economy has lost 1.3% of jobs (the worst growth rate in the nation), while NH added 1.3% more jobs (21st among all states). 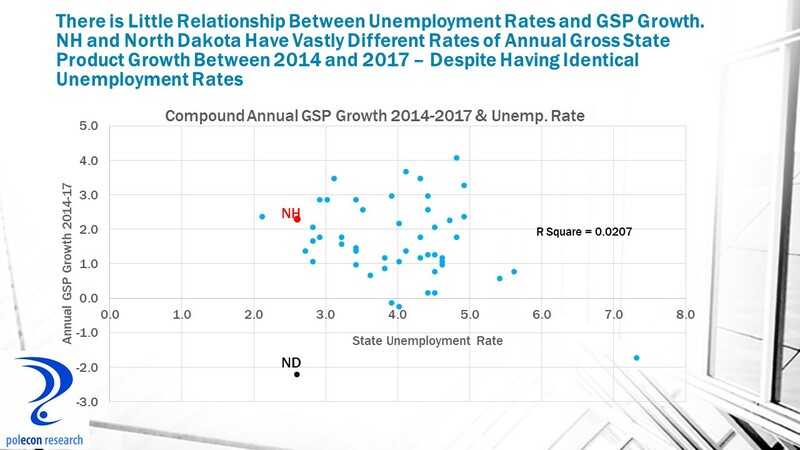 The same is true when state unemployment rates and the annual growth in state gross state product (the broadest measure of economic growth) are plotted (chart below). In 2017 NH tied with Michigan for 25th among states for growth in gross state product (at 1.9%), despite NH having a 2.6% unemployment rate while Michigan’s rate is 4.7%. The scatter plots above and below urge caution in using unemployment rates to gauge economic growth in a state, especially now that slow labor force growth is contributing to low unemployment rates and acting as a binding constraint on economic growth in many states. Growth in NH’s business tax revenue has historically tracked private sector employment growth in the state. To show just how unusual the recent growth in NH’s business tax revenue is in relation to job growth in the state look at the following chart which shows how far, by historical measures, the recent growth in revenues has outpaced NH’s private sector employment growth. Private sector job growth has picked up in recent months (defying reported growth in the size of NH’s labor force – and suggesting to me that NH may be (re)capturing some of the state’s labor that has been working outside of NH – but more about that in a future post). However, growth in business tax revenue has far exceeded that which historically accompanied similar rates of job growth. Changes to federal corporate tax laws are a primary reason for the out-sized boost in NH’s business tax revenues, so whatever you think of the recent federal tax reform you can thank the feds for their role in creating NH’s current budget surplus. The NH Department of Revenue provided lawmakers with a briefing on what tax reform could mean to NH’s revenues but they were rightly cautious in making a dollar forecast of impacts. But a summary of their analysis of impacts suggests that more of the provisions of federal tax law will increase rather than decrease NH revenues. 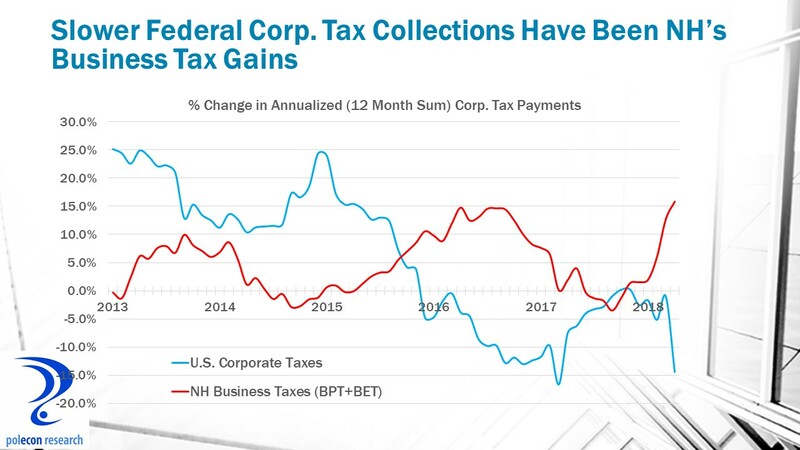 The impact on NH revenues of federal corporate tax collections is also apparent when comparing annualized growth in federal corporate and NH business tax revenue in recent years. 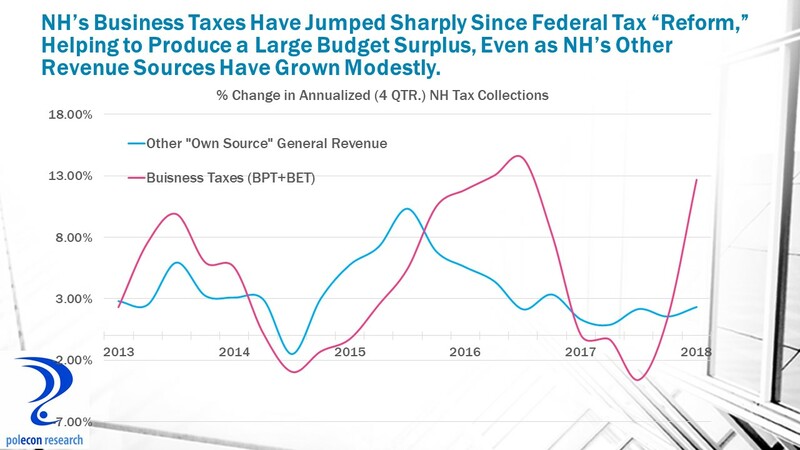 The chart below shows how dramatically different are the most recent trends in business tax revenue growth at the federal and NH state level. In addition, surprisingly (to me at least), this inverse relationship seems to occur over the longer-term as slower growth in federal corporate tax collections since the recession are associated with higher growth in NH state business tax collections (and vice versa), despite the fact that economic growth in NH lagged U.S. growth during much of the recovery from recession. I have argued in prior posts that lawmakers should be cautious in budgeting because revenue growth in NH, although growing, was growing more slowly. I did not foresee a $100 million budget surplus but who did, and who knew what the impact of federal tax reform would be. No public hearings or discussion of the federal tax reform proposal were held and in any case nobody was certain whether changes in corporate tax laws would pass. Growth trends in most of NH’s key sources of state revenue have been modest even as federal tax reform quickly and dramatically altered NH’s business tax revenue trends, greatly improving the state’s fiscal position in the process. I believe that fundamental underlying revenue trends still argue for caution in state budgeting, but when the federal government’s actions contribute to a state surplus NH is happy to say “yes please and thank you.” Lawmakers would be wise , however, not to assume that cuts in the state’s business taxes are responsible for the growth in state tax revenues or that larger cuts will add to the surplus. This entry was posted on May 24, 2018 at 8:19 am and is filed under Fiscal Policy, NH Economy, tax cuts, Tax Revenue, Uncategorized. You can subscribe via RSS 2.0 feed to this post's comments.